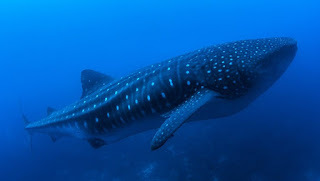 Sea-Changers Blog: Galapagos Whale Shark Project - What do the Big Ones Eat? Galapagos Whale Shark Project - What do the Big Ones Eat? "I am a MSc student studying Tropical Marine Biology and for my thesis I am working with the Galapagos Conservation Trust (GCT) on their Galapagos Whale Shark Project (GWSP) using tracking data of pregnant whale sharks which are not found in other aggregations.Whale sharks are a vulnerable species which are often caught in fisheries based in Central America and south east Asia. It is believed they are part of a global population so this affects the total population.We are looking to increase awareness of this aggregation to increase overall protection of the species.Understanding the life history of this species is important to the overall conservation of them, especially these pregnant individuals". Rory's Blog - What do the big ones eat? During the summer months the British Isles hosts the second largest fish on earth, the basking shark (Cetorhinus maximus) growing to a maximum size of 12m. They come here following their main food source, plankton, which blooms in the waters surrounding Britain during the summer months. This forms the basis of many trips to the Isle of Man and other hotspots during these summer months. 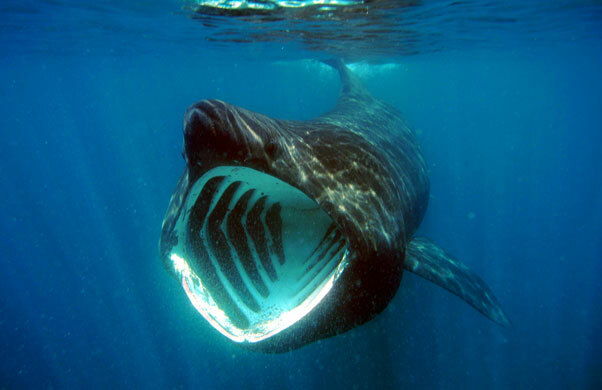 Basking sharks are among only 3 species of filter feeding sharks, the others being the megamouth shark, Megachasma pelagios, and the whale shark, Rhincodon typus. While basking sharks are found in all temperate waters their larger counterpart, the whale shark is only found in tropical and subtropical waters. Very little is known about whale sharks which reach a maximum reported size of 20m yet somehow there were only 320 documented sightings before 1986. What we do know about the whale sharks comes from the 13 predictable aggregation found throughout the world annually the largest of which is found of the Atlantic coast of Mexico around the Isla Mujeres in early July . Yet all but one of these aggregations are comprised of immature (>6m) males. Yet in the Galapagos islands, where the Galapagos Conservation Trust (GCT) is involved in the Galapagos Whale Shark Project (GWSP) has access to the only pregnant female whale sharks found in the world. This project has been running since the mid-90s and with new technology is now involved in tracking projects of these giants. Expeditions have taken place every cold season (June-December) since 2011 tagging individuals, the largest whale shark tracking project one earth. All in order to understand more about the largest fish on earth. Combining this data with tracking data GCT has begun to understand why the whale sharks are there. It may seem obvious but beforehand there was no evidence, but the main reason these pregnant individuals are passing through the Galapagos and into equatorial waters is food, zooplankton to be precise. While we don’t know where these animals give birth it seems likely that it is in the deep Pacific Ocean, with the Galapagos acting as a sort of service station. So like the British Isles the Galapagos archipelago hosts some of the largest creatures on earth, eating some of the smallest. and if you are specifically interested in whale sharks please visit the series of blogs detailing the recent discoveries of the GWSP and threats that they face click here.